Changes. But for the better? In the wake of a terrible few weeks for cycling, a dooring in Melbourne, a nightmare rear-ender in Brisbane and multiple riders being hospitalised in Sydney – all seemingly due to inattentive car users – a few Sydney clubs have been making changes. Eastern Suburbs Cycling Club, the club directly affected by the shocking Sydney incident, have removed Southern Cross Drive from their ride roster entirely. 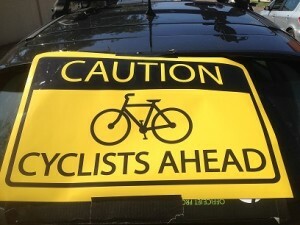 Randwick Botany Cycling Club havetaken a different tack and are now endeavouring to make their club rides vehicle-supported, with a tail-end vehicle equipped with “cyclists ahead” signage. I’ve seen mixed opinions on this, and I’m not sure of the full implications of these two announcements myself. But I do have some commentary. With regard, first, to Eastern Suburbs changing their ride roster to avoid Southern Cross Drive, this is a change which has made the local press and elicited plenty of comment (some from mouthbreathing idiots, naturally), but is it a good thing for safety overall? I’m not 100% sure. ESCC’s rides will now, it seems, head south towards the Royal National Park along Gardener’s Road and Princes Highway rather than the more direct Southern Cross Drive. Gardeners Road is a route I’m not unfamiliar with myself. Sections of it form part of one of my longer morning commute routes, and during my first attempts to get back on the bike in 2011, it formed part of my ride to work. As I see it, Gardener’s Road and Princes Highway is the more dangerous route of the two. Southern Cross Drive is a broad, consistent multi-lane clearway. Gardener’s Road is, conversely, criss-crossed with other routes, traffic lights, parked cars and tricky lane layouts which open and close the left lane depending on the width of the road. It’s also heavily used by commercial traffic, as it passes through an industrial zone heavily populated with logistics companies who’ve – not unsuprisingly – sited their operations close to the airport. On my own commutes I take an alternative route (Coward Street) better suited to solo riders, but that’s sorely unsuitable for groups. Princes Highway, too, is a main artery with heavy traffic patterns. ESCC’s route, as I understand it, will take them from Gardener’s Road along Princes Highway into Rockdale, presumably to turn left at Bestic Street. My own club’s Waterfall route joins Princes Highway a little way after the Rockdale section, and I’m glad of it. The run-in to Rockdale is peppered with traffic lights, side-roads and, towards the end, parked cars, though when ESCC is passing through it should be under clearway regulation. The speed limits on these roads are slightly lower than Southern Cross, but we all know that doesn’t actually mean traffic will be travelling below that limit. Lastly at a time when Southern Cross Drive is so heavily in the news, attentiveness from drivers who keep up with the news should be at an all-time high on that road. And instead ESCC decide to switch to a route with potentially more objective danger, which hasn’t been historically traversed by clubs heading south. The only possible upside I can see may be that driver attentiveness is generally higher away from Southern Cross, since there is more to think about. It’s easier to let your attention drift on a freeway than a suburban road. Needless to say, I’m not really a fan of the change. But I’m willing to see how it pans out for the club before writing it off. I’ve been wrong before. Moving to the topic of RBCC’s supported rides – I think this is overall a great idea. There are some potential downsides which may or may no make themselves clear over the coming weeks. For one thing, I wonder about the frustration levels of drivers tailing a vehicle-supported bunch as opposed to an unsupported one – since a car supported group will be much harder to bully into the gutter lane with aggressive driving. It’ll certainly be impossible for a texting driver to plough into the back of the peloton, but I worry about the more sociopathic breed of drivers attempting suicidal overtaking moves and ending up inserted between support car and bunch, or trying to overtake and ending up cutting across the group anyway – a support car, aside from raising awareness, does little to prevent a left-turning driver who is determined to get to his side road just before the riders and thinks he can pull off an overtake into the bargain – I’ve seen this happen on LACC rides. Still, of the two developments, I think the supported ride, while logistically harder to arrange, is the one I’d rather be on. I’ve approached both clubs for comment on how the rides went over the weekend, and will report back with comments. For now, I’ll be keeping a weather eye out, fretting about road safety and getting into more friendship-terminating arguments on Facebook.